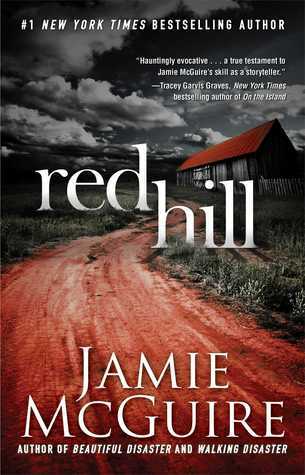 Today I will be sharing with my readers my book review of Red Hill by Jamie McGuire. To check out more about the book and to be entered in a giveaway to win a copy for yourself CLICK HERE - on my original tour stop. The much anticipated new release, RED HILL by Jamie McGuire made it's way across the blogosphere causing excitement for zombie lovers everywhere. I myself was so very anxious to get my hands on a copy. So when a blog tour offer presented itself to me I jumped at the chance to join in and review Jamie's newest novel. I am a huge fan of the author having read Beautiful Disaster a while back. I knew to expected something fabulous once again. Alas, sadly I was disappointed. I was so hoping for a epic adventure, something new and fresh within the zombie craze. While, I didn't hate RED HILL per say. I didn't love it either. There was a most definite love hate relationship for me while reading. So let me explain myself, and my reasoning behind these feelings throughout the book. The Good, The Bad and The Zombies? I myself am a huge fan of the comics and TV show "The Walking Dead" as I know many of you are as well. Red Hill had way to many similarities throughout the book. Now, I am in no way saying the plot was copied but it gave me the feeling I was reading or watching a episode of the show. The concept felt overdone and was like so many other zombie novels I have read before. It was difficult to find any unique or compelling attributes that set Red Hill apart for other zombie books out there. While I wouldn't say this is necessarily a bad thing, for others, but for me it became more tiresome than anything. I keep hoping for something new and thrilling to happen but I just didn't get that. Other than my disappointment in concept I found myself being quite upset with another part of the story. ALL MY FAVORITE CHARTERERS DIED!!! All or most. I would get so involved in certain character(s) and their pasts then....BOOM, ....DEAD! I know, I know, some are bound to die at some point in the book. I mean we are dealing with a zombie apocalypse here, right? Jamie knew exactly how to make you fall in love with a character then only to later see him or her get killed in the end. Hmmm... not sure this was such a BAD thing but most definitely very sad for the reader and if your anything like you'll need a box of tissues nearing the end of the book. In all honestly there was quite a bit of greatness in Red Hill. One being the main and secondary characters. As the story is being told from multiple POV's the reader actually can see the plot and story unfold from three different characters. Scarlet. Nathan. Miranda. All fighting their way to safely, in pursuit of reaching Red Hill. Each character with their own and unique story to tell. Somewhere in the middle their stories and lives become one. As each of them reach this safe haven, Scarlet, Nathan, Miranda (and of course many secondary characters) are now left to deal with not only the consent fear of approaching zombies but the unknown of what comes next. Another thing I really loved about Red Hill is the romance between TWO certain characters...I can't say who or I would end up spoiling things but I enjoyed immensely how the Author Jamie McGuire found a way to write such a beautiful love story into such a sad and heartbreaking novel. Whatever Jamie decided to call them in her novel was perfectly fine with me. There was just the right amount of blood and gore in the book. Not too gruesome or scary, and not a bit anticlimactic in the least. I really enjoyed learning in the beginning how the infective being affected by the virus that pretty much changed the world we know it. If you're a zombie die-hard fan or a "The Walking Dead" fan I would most definitely Red Hill. My review won't post for a few weeks, but I share similar feelings. This wasn't bad, it wasn't great, although if the characters had been more fleshed out and the plot more realistic it could have been. Great review.